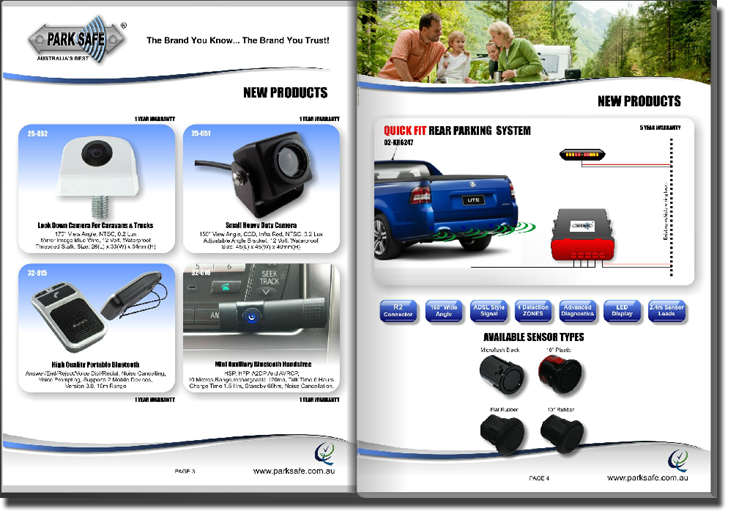 “PARKSAFE” is Australia’s leading supplier of parking sensors, cameras and monitors to the OEM, wholesale and retail market. Our products are quality assured, reliable and come with a factory backed warranty. PARKSAFE have been developing reversing sensors for the Australian market since the late 80's and continues to lead the industry in the development of Ultrasonic parking systems. Parksafe is a supplier of 'OE' parts to Australian vehicle manufacturers and provides ongoing research and development of new technologies for the industry. What makes PARKSAFE better than every other brand on offer in Australia is that PARKSAFE has been developed to cope with our harsh climate and driving conditions.PARKSAFE Platinum Series sensors come with a factory backed 3 year warranty whilst our 'top of the range' Pro Series sensors have a 5 year warranty. All PARKSAFE parking systems, whether they utilise 2 or 4 sensor heads, are free from the 'blind spots' typically found in low quality sensor kits with narrow detection zones. Due to their low cost designs, most other parking sensors can only offer 90 degree wide detection zones therefore creating numerous "Blind spots' behind the vehicle. Your child might be playing in one of these blind spots! Yes there are cheaper alternatives, but as the saying goes "You get what you pay for!" Insist on the BEST...Ask for "PARKSAFE". Australia's best reversing sensors. Click Here!